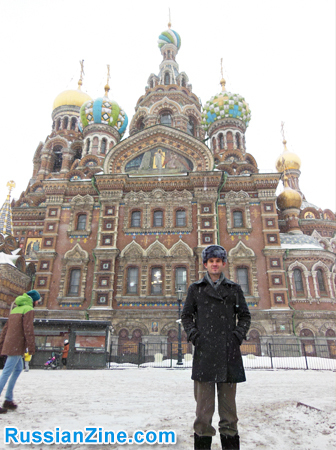 Russia has always fascinated me and has played a large role in my life since my teenage years. While my peers played video games and snuck alcohol from their parent’s pantries I was always up late lost in a book about Russian History or biographies of historical figures. My interests’ ranged from Kievan-Rus, Rurik and Romanov Dynasties, all the way up to the Soviet Union. I loved it all. As the years went by I put more emphasis on Russian culture itself rather than just the historical/political side of things. I enjoyed the films, particularly the fun and innocence of the Soviet comedies –rather than the raunchiness of Western/American comedies. I laughed at their jokes about their politics and customs and I very much enjoyed their cuisine. The food quickly became my new favorite aspect about Russian life next to their fascinating History! Over the years I had sucked up so much information like a sponge about Russia but there was still something I still had yet to do: Go to Russia. I researched study abroad institutes until I came across one which seemed promising. I applied and I was accepted! I still had a lot of time on my hands before the journey began and at that point it still had not sunken in that I would be going to Russia in just a few months With the time I had left I utilized a wonderful interactive program online that prepared me for my trip. I finished school and survived the holidays and then before I knew it January had approached and I was set to leave on the 31st. The time went by in a flash and I was on my way to Heathrow airport in London and then finally off to Pulkovo Airport in St. Petersburg, Russia. We boarded a Russian-bound plane and I was sat next to a middle aged, conservatively dressed, and fancy-looking Russian woman who was fluent in French. I felt like I was sitting next to a member of the Russian nobility from Imperial Russia! She brandished quite a fiery temper when the flight attendant made her put her expensive purse under the seat. I was a bit intimidated but I bravely struck up a conversation with the woman. I was met with an initial standoffish attitude but she warmed up to me quite quickly and became very curios. She was amused that an American student was so fascinated with her culture and was studying her language. She helped me with some vocabulary and a few simple mistakes I made while speaking to her and it was a pleasant experience. I had my first conversation with a Petersburg local and I wasn’t even in the country yet! As the flight approached an end I anxiously stared out the window. A thick floor of clouds was below us and the sun was shining bright almost as if it were summer. Then suddenly the plane descended downwards into the clouds and everything went from bright and sunny to overcast and snowy. At that very moment it sunk in that I was here. My mind entered into a state of utter euphoria. After almost 10 years of yearning and dreaming, I was finally here. I was in Russia. Everyone got settled at the dorms in the university and then the next 2 weeks consisted of touring around and the program directors showed us the ropes and whatnot. One of the first things I saw was a giant ship called the “Aurora.” She was used in the Russo-Japanese war but she was also played an integral role in the Russian Revolution. 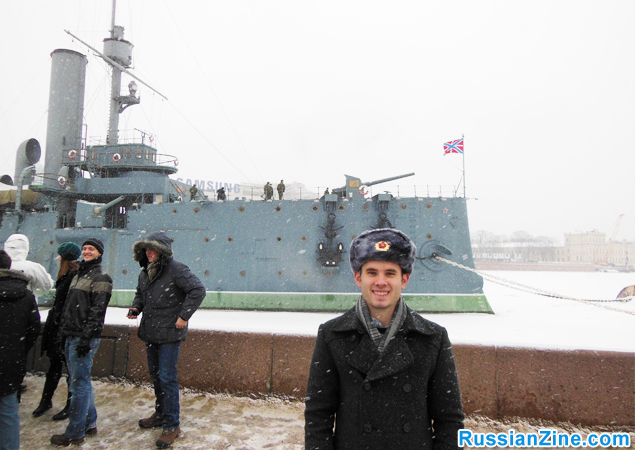 Her cannon fired as a signal for the Bolsheviks to storm the Winter Palace and arrest the Tsar. One of the things I immediately noticed about the ship was the Red Star on the hull. After the 2 weeks of touring and learning we were finally taken to the downtown area on the main street of Petersburg for an on-foot tour. This marked the last time we would be under supervision and then we were left completely on our own to do as we please for the entire few months of our stay. Everywhere I turned I was staring at history right in the face. There were statues, museums, monuments, and the architecture up and down Nevsky Prospekt was absolutely breathtaking. One of the first places I went to was the Hermitage, which is a given for any tourist. 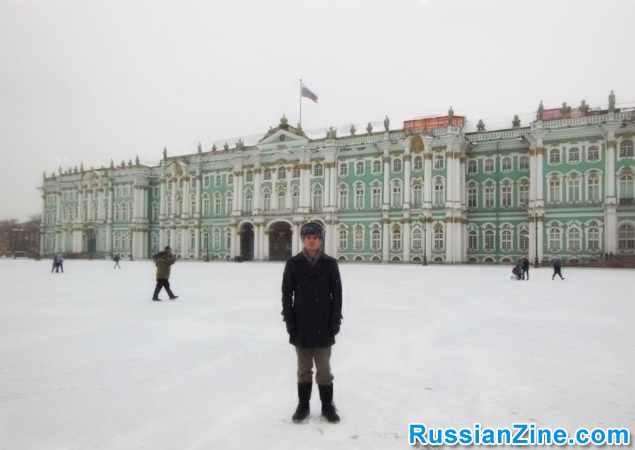 If there was any tourist in Russia that didn’t visit the Hermitage I would say shame on them. This magnificent museum contains the largest collection of art in the entire world. It is so large that if you spent 3 seconds looking at every single piece they have it would take 9 years! I spent hours in there and I only saw a fraction of the massive collection. The list goes on and on! Out of this list my favorite was the Spasno-Krovi but also the State museum of Political History of Russia. This museum focused primarily on Soviet History from the revolution all the way to Glasnost. It was originally used as a propaganda outlet for the “Achievements of Socialism” but now it’s presented in a much more transparent and honest manner. As for the Spasno-Krovi, it was just beautiful. See for yourself! 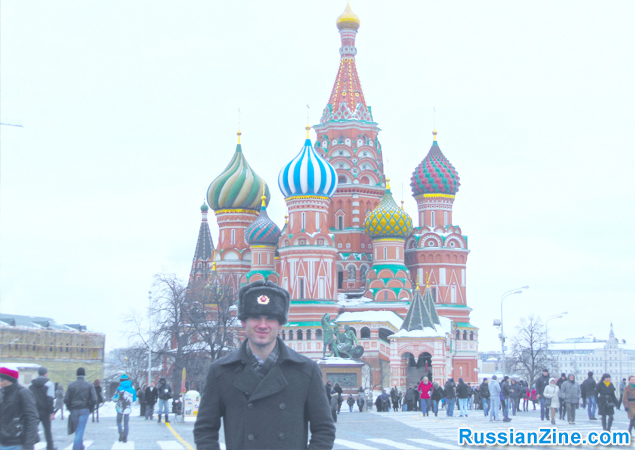 We went on a 3 day trip to Moscow in March where we of course visited the Kremlin. It was a gigantic fortress with a number of things to observe and photograph! Red Square was wonderful! I was greatly appreciative that I had the chance witnessed the changing of the guard ceremony for the Tomb of the Unknown Soldier. Within the Kremlin there were various museums featuring precious treasures from Tsarist times such as crowns, sabers, carriages, and lavish clothing. Also in the Kremlin there is a special Cathedral called The Cathedral of the Archangel of Michael which is the resting place of many Tsars. 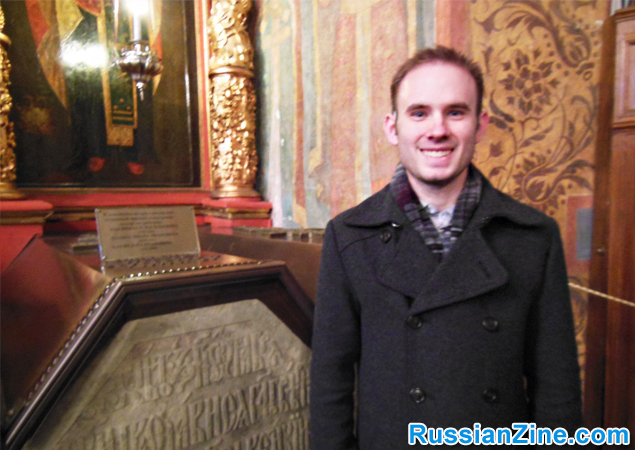 I stood next to the coffin of Ivan the Terrible and snapped a photo although it wasn’t necessarily allowed. We also went to perhaps what is the most famous cemetery in Russia where many well known people were laid to rest. I saw the tombstones of composer Dmitri Shostakovich, famous film maker Sergei Eisenstein, Stalin’s wife Nadezhda Alliluyeva, and Soviet leader Nikita Khrushchev and Boris Yeltsin. There was only one major disappointment; Lenin’s tomb was closed for renovation. Now we should take a few steps back to earlier in my trip. I learned to get around quite a bit all on my own. I just happen to be the kind of person that usually likes to go everywhere by himself. One of my favorite things to do was ride the metro. It didn’t matter where I was going I just loved to see all the different people and the metros themselves are akin to museums and they’re squeaky clean and are works of art. They were a breath of fresh air from the London Underground which was dirty and extremely confusing. When I rode the Petersburg metros I would get off at random stops just to be able to see something new outside. My first official voyage in which I was completely on my own was when I went to “Lenin Square” (Ploschid Lenina) just to take a picture of the enormous statue outside of the “Finland Train Station” (Finlandski Vokzal). 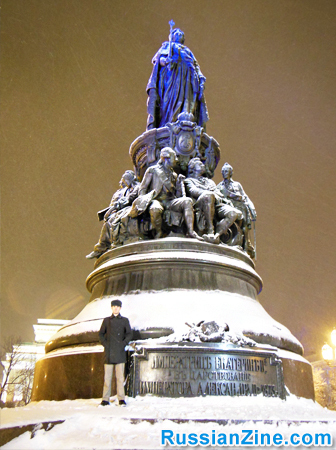 While I was there I approached a young gentlemen with my knowledge of Russian language I asked if he would take 2 or 3 pictures of me in front of massive statue and he obliged. Another way I used my knowledge of the language which helped immensely was back when we were left alone on Nevsky after the foot tour. A couple kids wanted to go to the bars and some wanted to go to restaurants but I simply wanted to walk around and see the city life. I was too anxious to just sit down at a restaurant or to sit at some bar and drink. What a waste of time! So naturally I went off alone. I bought a couple of souvenirs and chatted with some of the curious employees in the stores and next thing I knew it was getting dark. At that time I still did not really know much about the metros and how they worked and I knew I needed the “red line metro”. I grew nervous seeing as it was my first time alone at night and I started panicking. I began asking random locals for directions and they’d point me one way and then I’d follow that and then ask more people as I went. I ended up asking 2 policemen and they directed me to the Red Line metro! I was very relieved! Later in my trip I went to quite a few souvenir and gift shops to get things for myself and a couple of knick-knacks for my friends and family back home. One visit that sticks out in my mind is when a worker at one of the shops, a middle aged woman, struck up a conversation with. I was met with that initial curiosity and we engaged in small talk. “Where are you from, what are you studying,” etc. She suddenly told me that I was a “krasivi molodoi chelovek” which translates to “a Beautiful young man”. She reached into a box full of souvenir medals and pinned a Soviet ‘znachok’ (pin medal) on my coat with a picture of Lenin. She smiled and said, “It’s a gift”. 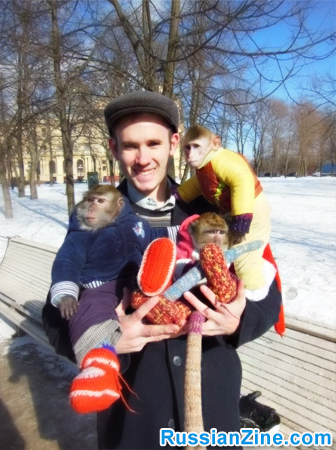 There was one very interesting aspect of Russian society which I had noticed throughout my entire stay. Many folks there still have an immense amount of nostalgia or fond memories for the “good ole’days,” more specifically, life in Soviet times. In other former Socialist countries such as Hungary and Estonia they want almost nothing to do with that part of their history. In fact almost all statues and monuments in Budapest have been dismantled and shipped off into the outskirts of Budapest to be used as a tourist attraction. In Russia however, Lenin’s statues still stand tall with roses placed under the by the locals. Several of them do, in fact. You will also never go a day without seeing a hammer and sickle. In fact I saw one every single day when I would go to school and come back home. In my metro stop there was giant bronze cast of the Soviet coat at the very end of the hall. I witnessed some demonstrations along Nevsky Prospekt of Communist parties and when I passed by them I had a placard of Stalin’s portrait waved in my face. There was one day in the metro of Gostini Dvor I listened to a choir of about 8 babushkas singing songs of their youth in the Pionir days. They also sang the very catchy tune “Shiroka strana moya rodnaya!” which is “Song of our country”, a very nationalistic song from the Stalin era. The nostalgia for the USSR is commonly dismissed as old timers crying out for their youth. This may be partly true but to say they encompass all of it is absolutely not true. I spoke to quite a few locals in their late 30s, 40s, and more middle aged folks who grew up in the more ‘relaxed’ years in the late 60’s the 70’s. This period is commonly referred to as the “Brezhnev era.” The ones I had talked to spoke quite fondly of those years. Later on when I moved in with a host family they even spoke positively about those days despite hating the Communist Party. Having studied the history of the USSR for quite some time I had formed my own opinions and some certainly differed from theirs, but who was I to judge them? I made the wise choice and I only listened. One thing I found quite comical was the fact that this high end clothing store ecco is just below a hammer and sickle carved into the building at the time it was built. It was such juxtaposition! The cultural differences were rather apparent on the very first day. Once I was settled in my dorm I took walks outside the university and quickly learned that you do not smile or say hello to any passersby you come across. I was not used to this seeing as where I come from everyone says hello and smiles. Also, it is not okay croon over anyone’s dog when walking by or saying hi to someone’s kid or commenting on how cute they are. Again, where I come from this is done all the time but in Russia this is a huge mistake. You may even be met with hostility. When asking for directions some of them may be very helpful while others pretend you’re not even there; you’ll just have to get used to that and not take it personally. If you’re going to live with a Russian family, one thing I noticed is they want you to be as upfront as you can be. For example, one of my peers said that his host-family yelled at him because he would always say “good,” (khorosho) whenever they would ask him how he was doing. They knew he was not being genuine. Customer service is definitely not a virtue in Russia. In western culture it may be okay to abuse and chastise a worker because you felt you didn’t receive “good service.” In Russia this is not the case. If you take too long to get your money together they may sigh in frustration and certainly don’t expect many smiles. If you want to “speak to the manager” about a bad customer service experience you can forget it. Also, don’t even try to pay with kopecks or with large bills. One thing I noticed everywhere is they hate making change. Just have your money ready and always carry 100 ruble notes. Don’t hand a cashier a 1000 ruble note for a total sale price of 400. One thing I feel I must mention is the standard of living in Russia. Although it’s not necessarily the culture but it still influences the way Russians think and feel. Firstly, washing machines are still seen as luxuries. Many homes do not have them and you’ll have to wash your clothes in the bathtub. Keep in mind, however, you are in Russia and especially if you’re there in the winter you’re not going to sweat that much. You’ll just have to wash your socks and underwear most of the time, big deal. If you’re lucky enough to have a house with a washer, it’s out of the question that they’ll have a dryer. You have to hang your clothes up. Again, it’s not a big deal. The apartments themselves may be rather cramped than what we’re used to, especially in the West. The tap water is undrinkable so you should stock up a bit on bottled water from the stores. Otherwise you can get a nasty parasite that will leave you on the toilet for a few days. One of my peers had gotten sick from the water. It was not pretty. Another thing worth mentioning is most apartments won’t have internet access. Despite all this, you’re in Russia. Get out and explore. You shouldn’t be on the internet and you shouldn’t be whining about your tiny living space because you should only be there to eat and sleep. Get out there, go to Nevsky Prospekt, go to museums, admire the buildings, enjoy the constant street entertainment, and eat the food! The most important advice I can give is to learn the basics of Russian Language. This does not mean to take a Russian 101 class at a community college, however. Those kinds of language classes are complete joke. You need to find an interactive online program and there are many out there. I used RussianAccelorator.com to learn Russian and I swear it saved my life at times while I was in Petersburg. I have a few other small tips I’d like to share as well. 1. If you’re a vegetarian, don’t go to Russia. 2. Don’t be loud and obnoxious. You may at times see some rowdy young Russian kids but generally most of the teenagers and the adults are very quiet and reserved people. If you are loud they will stare at you in disgust. This happened with my group and so for the rest of the trip I’d always sit or stand away from them during excursions. 3. Blend in as much as you can. Don’t wear the baseball cap of your favorite team or a sports jersey. 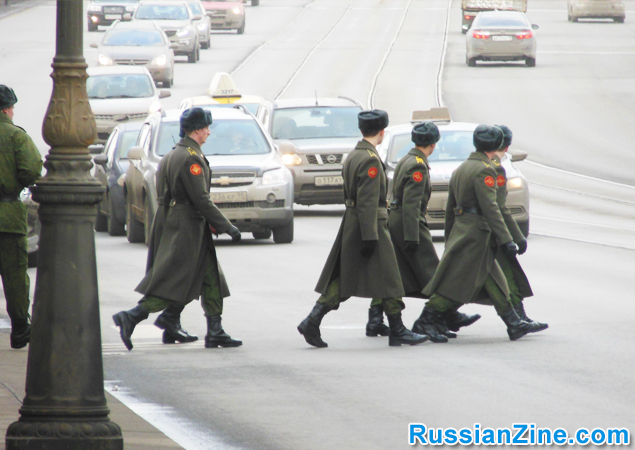 Russians dress very conservatively with dark clothing. On one occasion I went out for a walk wearing my bright white pair of khaki pants and every Russian that passed me by could not stop staring. After that I stuck with my black and grey pants and I’m still afraid to wear those pants! On a more serious note, keep your documents on your person at all times. I cannot stress that enough. The Russian police have the authority to ask for your documents at any time for any reason. If you don’t have them on you they will take you to the police station and make some phone calls to find out exactly who you are. There was a story floating around about one student going across the street from the university to get some milk and didn’t come back until the evening because he spent the day at the police station. There was one instance in which I forgot my own documents and I had just realized it when I arrived on Nevsky Prospekt. I was so fear stricken that I immediately took the lengthy metro ride back to my apartment to get my documents. While in Moscow, since we weren’t registered with the city, we had to have our passport, student ID, and about 5 pieces of paper on our person at all times. In closing, if you do decide to go to the Motherland you’ll be in for quite a treat! Let’s say you’re a student and you want to study abroad in Europe; It’s almost a cliché’ nowadays to choose France, Germany, or Spain. Russia however is much more exotic and it would stand out especially on your transcript for College applications! With that being said, it’s just a rather beautiful and interesting place which vastly differs from Western Europe. You may find yourself understanding Russia as a country a bit less than you did before you ever even set foot on its soil. In my opinion, that’s the beauty of it all! Previous: What Is a Russian or Ukrainian Wedding Like?